You should be concerned if Ad Expert Browser is running on the operating system. Even though this application is categorized as an advertisement-supported program, we can assure you that it is much more than that. Of course, the initial task for the application is to flood you with various advertisements, and they could be dangerous as well; however, it is infamous for other activity as well. You should continue reading to learn why you need to and how you should remove Ad Expert Browser from the PC. 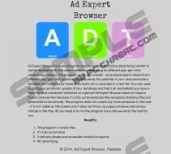 The official site responsible for the representation of Ad Expert Browser is adexpertbrowser.com. Here the application is introduced as a tool for the analysis of the online advertising market. However, in the Benefits section it is indicated that the application is not related to advertising. Well, this is not what users dealing with flooding advertisements will tell you. In fact, one of the most important reasons behind Ad Expert Browser removal is the suspicious third-party advertisements. The application developed and signed by Mayris Corporation supposedly uses web cookies to collect the so-called statistical information. 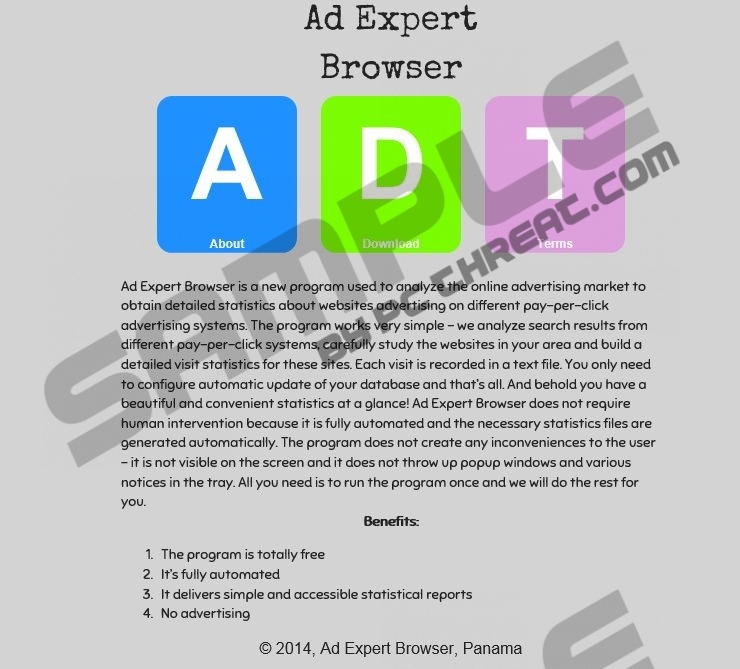 Moreover, researchers have discovered that Ad Expert Browser works as a bot – an application running automated tasks using web connection which, in this case, is unauthorized. The program can generate profits using yellowsearchme.com and similar search engines without any of your knowledge. Nonetheless, if you do not delete Ad Expert Browser, you are bound to witness highly disturbing activity which even could aggravate the removal of adware. As researchers have recently revealed, Ad Expert Browser can slow down the speeds of your Internet connection and the computer itself. If you are running a less powerful, older computer, you may even face system crashes because Ad Expert Browser consumes system resources by operating the searches and automatically clicking on ads in the background. Needless to say, this activity is unauthorized, and you should not allow it. Before you jump into removal processes, you need to scan the operating system for additionally running threats, including AllDaySavings, OffersWizard, Plus-HD, etc. Make sure you delete all of these suspicious programs as well. Ad Expert Browser may be presented as Mayris Intelligent Internet Services. This is the name you need to look out for when using the manual removal instructions below. Even though computer users may be able to delete Ad Expert Browser manually, there is no doubt that automatic removal is much more reliable and effective. Use this software to delete Ad Expert Browser and any associated threats. Select the undesirable program and click Remove to eliminate it. Right-click anywhere on the Metro UI menu and select All apps. Now click Control Panel and choose Uninstall a program. Navigate to the program you wish to delete, right-click it and select Uninstall. Quick & tested solution for Ad Expert Browser removal.